At Symbiose, we know how your smile is important to you. It reveals who you are and it conveys how you are feeling. 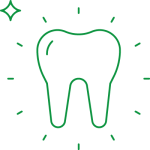 We offer a range of solutions to make your smile bright and unique. Do you dream of having whiter, brighter-looking teeth? Teeth whitening is the most effective, fastest and safest method to achieve a brighter smile. Various factors cause teeth to discolour, such as age, smoking, poor eating habits, or even some medications. Improving the look of your teeth starts with a dental examination to check their health condition. Then you may choose from among two options: a single-appointment teeth whitening treatment at the clinic or home treatment. In-office teeth whitening performed at the clinic yields fast, very effective results. After about one hour of chair time, you can leave with your customized trays to complete the treatment at home in no time, in three to four days. To whiten your teeth at home, we craft customized trays for you using your dental impressions. You only need to apply whitening gel to your trays and wear them according to your dentist’s recommendations. The home treatment lasts about two weeks. We can quickly improve the look of one or more of your teeth with dental veneers. Did you know that this kind of treatment can correct the colour and shape of your teeth, straighten them, and even close gaps between them? To suit your needs, we can customize composite veneers or much more durable porcelain veneers.